This article is about the area in Manhattan. For the Related Companies project, see Hudson Yards (development). For other uses, see Hudson Yards (disambiguation). The term "Hudson Yards" is used to refer to the MTA rail yards along the Hudson River between 30th Street and 34th Street, but has also been used to refer to the entire area being redeveloped, an irregular shape extending as far south as 28th Street and as far north as 43rd Street. The portion of the yards between the river and Eleventh Avenue is called the Western Rail Yards, and the portion between Eleventh Avenue and Tenth Avenue is called the Eastern Rail Yards. The Hudson Yards area includes parts of the Garment Center, the Javits Convention Center, Madison Square Garden, the Port Authority Bus Terminal, the Farley Post Office, and the Lincoln Tunnel. Most of the Hudson Yards redevelopment area has historically been considered a part of Hell's Kitchen. The special purpose district covering the area, the Special Hudson Yards District, includes a "Hell's Kitchen subdistrict." There has been a long series of proposals to develop the rail yard air rights, including for a major expansion of Midtown Manhattan by William Zeckendorf in the 1950s and for a housing development considered by U.S. Steel in the 1960s. The idea of building housing on air rights over the rail yard, with commercial development between 34th Street and 42nd Street, was included in a 1963 plan announced by Mayor Robert F. Wagner Jr. The administration of John Lindsay maintained the goal of the 1963 plan—a westward expansion of Midtown—but shifted their focus to the blocks north of 42nd Street, home to 35,000 residents of the Hell's Kitchen neighborhood. As a first step, the City approved a convention center on 44th Street. But after the defeat of a bond issue that would have funded a 48th Street "people mover," the City abandoned the rest of the master plan. At the same time the local Hell's Kitchen community proposed that midtown expansion take place south of 42nd Street instead. A community-proposed convention center site—between Eleventh and Twelfth avenues from 34th to 39th streets—was later promoted by Donald Trump, who had obtained an option on the rail yard from the bankrupt Penn Central in 1975. Facing political opposition and the severe fiscal crisis of the 1970s, the City and State eventually chose the rail yard site when the 44th Street site proved to be too expensive. However Trump's offer to build the convention center was rejected. In 1987 the Metropolitan Transportation Authority (MTA) converted the remainder of the rail yard into a storage facility for commuter trains; the new West Side Yard was designed with space left between the tracks for columns to support development in air rights above the tracks. Despite the completion of the Jacob K. Javits Convention Center in 1986, no further development took place. One impediment to development was a lack of mass transit in the area, which is far from Penn Station, and none of the proposals for a link to Penn Station were pursued successfully (for example, the ill-fated West Side Transitway). No changes to the zoning happened until 1990, when the city rezoned a small segment of 11th Avenue across the street from the Javits Center. However, as most of the area was still zoned for manufacturing and low-rise apartment buildings, the rezoning did not spur development. The Hell's Kitchen community's 1973 proposal for major office and residential development south of 42nd Street was finally realized when all impediments to development were addressed. In 2003, the New York City Department of City Planning issued a master plan that envisioned the creation of 40,000,000 square feet (3,700,000 m2) of commercial and residential development, two corridors of open space – one between Eleventh Avenue and Tenth Avenue, and another network of open space between Ninth Avenue and Tenth Avenue to create a park system from West 39th Street to West 34th Street, portions of which would be located along the Dyer Avenue/Lincoln Tunnel Expressway corridors. Dubbed the Hudson Yards Master Plan, the area covered is bordered on the east by Seventh and Eighth Avenues, on the south by West 28th and 30th Streets, on the north by West 43rd Street, and on the west by Hudson River Park and the Hudson River. The City's plan was similar to a neighborhood plan produced by architect Meta Brunzema and environmental planner Daniel Gutman for the Hell's Kitchen Neighborhood Association (HKNA). The main concept of the HKNA plan was to allow major new development while protecting the existing residential core area between Ninth and Tenth avenues. Aerial view of location of the Hudson Yards area, including the rail yard in the foreground, the Javits Center on the upper left, and the blocks between Tenth and Eleventh avenues up to 43rd Street. To help facilitate development, the City's plan called for extending the IRT Flushing Line to a 34th Street subway station under Eleventh Avenue at the rail yard, and next to the Jacob K. Javits Convention Center, which would be expanded by the State. To fund the subway and a park and boulevard and other infrastructure, the City proposed a novel tax-increment financing scheme within a Hudson Yards financing district to collect both residential property taxes and commercial payments-in-lieu-of-taxes (PILOTS) and sell transferable development rights to prospective developers. A Hudson Yards Infrastructure Corporation would issue bonds against expected revenues. In January 2005, the New York City Council approved the 60-block rezoning, including the eastern portion of the West Side Yard. The newly rezoned Hudson Yards area was to have 25,800,000 square feet (2,400,000 m2) of Class A office space, 20,000 housing units, two million square feet (190,000 m2) of hotel space, a 750-seat public school, one million square feet (93,000 m2) of retail and more than 20 acres (8 ha) of public open space. The rezoning and financing district did not include the western portion of the rail yard; this was reserved for the proposed West Side Stadium, which would have been built as part of the New York City bid for the 2012 Summer Olympics. At the conclusion of the Olympics, the stadium would have been used by the New York Jets. When not in use for football, the covered stadium would be a venue for conventions at the Javits Center, and so proposers dubbed the structure the "New York Sports and Convention Center." This effort, led by Deputy Mayor Daniel Doctoroff, was unpopular with both the public and politicians. Consequently the City Council insisted that financing for the city's broader rezoning plans not be used to subsidize the rail yard stadium. In June 2005, the stadium proposal was defeated. The City subsequently rezoned the western rail yard for residential and commercial development and added it to the financing district. The Metropolitan Transportation Authority (MTA) then sought to develop the 26-acre (11 ha) yard. In conjunction with the City the MTA issued a Request for Proposal (RFP) for a 12,700,000 square feet (1,180,000 m2) mixed-use development to be built on platforms over the rail yard, which would remain in use throughout. Five developers responded to the RFP: Extell, Tishman Speyer, Brookfield, Vornado, and the Related Companies. Tishman Speyer won the bid in March 2008. Tishman Speyer entered into a 99-year lease with the MTA, paying $1 billion for the air rights. It would also spend another $2 billion for development over the rail yards, including for the two platforms over the yards to support 15 acres (6.1 ha) of public spaces, four office buildings, and ten high-rise residential towers. However, just two months later, the deal broke down due to the late-2000s financial crisis. Subsequently, the MTA chose the Related Companies and Goldman Sachs to develop Hudson Yards under the same conditions. In December 2009, the New York City Council approved Related Companies' revised plan for Hudson Yards, and the western portion of the West Side Yard was rezoned. Following the rail yards' successful rezoning, the MTA signed another 99-year lease to the air rights over the rail yard in May 2010. The air rights were signed over to a joint venture of Related Companies and Oxford Properties Group, which invested $400 million to build a platform above both the eastern and western portions of the yard on which to construct the buildings. Groundbreaking for 10 Hudson Yards, the first building, occurred on December 4, 2012. In April 2013, the Related/Oxford joint venture obtained a $475 million construction loan from parties including Barry Sternlicht's Starwood Capital Group and luxury retailer Coach. The financing deal was unique in several aspects, including the fact that it included a construction mezzanine loan, that Coach was a lender on both the debt and equity sides, and that the MTA reused a "severable lease" structure (previously used by Battery Park City) that allowed for the loans. A portion of the project was also financed by the EB-5 investment program, which uses capital from immigrants who become eligible for a green card. After the Hudson Yards project was approved in 2005, the MTA received proceeds from the initial 2006 bond offering to pay for the 7 Subway Extension to 34th Street–Hudson Yards station. With funding assured, the MTA proceeded quickly to construct the extension. The first construction contracts were awarded in October 2007. After a series of delays related to the construction of the 34th Street station, the subway extension opened on September 13, 2015. The station connects to nearby buildings and developments, including 30 Hudson Yards and Hudson Park and Boulevard. The 34th Street station's main entrance, escalators and an elevator on the west side of Hudson Park and Boulevard between 33rd and 34th Streets, is at the foot of 55 Hudson Yards and is just half a block away from the rail yard's northern edge. Another station, planned for Tenth Avenue and 41st Street, was not built. The platform atop which the Related development is being built will include a 6-acre (2 ha) public square. In the middle of the square would be Vessel, a 16-story structure of freestanding, connected staircases that is designed by Thomas Heatherwick. Hudson Park and Boulevard, a four-acre system of parks and roads, is located north of the rail yard site, extending from 33rd Street to 39th Street, mid-block between Tenth Avenue and Eleventh Avenue. The boulevard is divided into a Hudson Boulevard East and a Hudson Boulevard West, with the park between the two. The first phase, between 33rd and 36th Streets, was completed in August 2015. Proposed parks between Ninth and Tenth avenues in the original plan were later dropped. The High Line, an elevated park using the former right-of-way of the southern portion of the West Side railroad line, runs along Hudson Yards' southern and western edges before continuing south to Gansevoort Street in the Meatpacking District; its northern terminus is at 11th Avenue and 34th Street on the north side of Hudson Yards. In 2012, the city government acquired the northernmost section of the High Line from CSX Transportation. In late 2014, the final phase of the High Line opened. It enters the Hudson Yards site and curves along 30th Street, Twelfth Avenue and 34th Street, with a spur (dubbed "The Spur") along 30th Street to Tenth Avenue. Related Companies intends to integrate the High Line with its buildings; for example, 10 Hudson Yards cantilevers over the Spur. Dubbed "High Line at the Rail Yards", the section will be built in three phases. The right-of-way from 30th Street will be extended into the Hudson Yards site, running parallel to 30th Street past Eleventh Avenue, and developed in a manner similar to the opened sections of the park. The Spur along 30th Street is slated to get an amphitheater, restrooms, trees and grasses above Tenth Avenue. Finally, the curved section around the western part of Hudson Yards was originally developed as an "interim walkway", with further construction in 2015. There will be an entrance to the High Line from within the complex. 30th Street staging area for construction equipment and materials. The Hudson Yards development is being built by Related Companies on top of a large platform bordered by 10th and 12th Avenues and by 30th and 33rd Streets. Construction on the platform began in 2014. The platform was to be constructed over the existing at-grade West Side Yard, allowing LIRR trains to continue to be stored during midday hours. The land parcel is bordered by 30th Street and Chelsea on the south, Twelfth Avenue on the west, 33rd Street and Hell's Kitchen on the north, and Tenth Avenue on the east. Eleventh Avenue runs through the site, and splits the redevelopment project into two phases. Before Phase 2 was built, an underground concrete casing was built for Amtrak's future Gateway Project under the Hudson River. Construction started in December 2014 and was nearing completion as of July 2017[update], though funding disputes stalled the tunnel box's completion. Phase 1, the eastern phase, contains two office towers on Tenth Avenue, plus a retail podium between them. The southern tower is the 52-story, 895-foot (273 m) 10 Hudson Yards, which opened in 2016. The other tower on Tenth Avenue is the 80-story, 1,337-foot (408 m) 30 Hudson Yards, which is the city's third-tallest building; it is expected to be completed in early 2019. Bordering Eleventh Avenue are two mixed-use buildings, 15 Hudson Yards and 35 Hudson Yards. 15 Hudson Yards, the more southerly of the two towers, is connected to a semi-permanent structure, a performance and arts space known as The Shed. The mixed-use 15 Hudson Yards was topped out in February 2018. 35 Hudson Yards, a mixed-use skyscraper located to the north of 15 Hudson Yards, was topped out in June 2018. Phase 1 also includes a 7-story mall called Shops & Restaurants of Hudson Yards. Phase 1 opened on March 15, 2019. The western portion of the yard is bordered by 30th Street and 33rd Street in the north and south, and Eleventh and Twelfth avenues in the east and west. The western phase of the project is to contain up to seven residential towers, an office building at 33rd Street and Eleventh Avenue tentatively known as "West Tower", and a school serving Pre-K to eighth grade students. The third phase of the High Line will traverse Phase 2 of the project. Work on the platform to cover the second half of the tracks is scheduled to begin in 2018. The entire project, including Phase 2, could be complete by 2024. 50 and 55 Hudson Yards are located just north of the West Side Yard on the block bounded by 33rd Street to the south, 10th Avenue to the east, 34th Street to the north, and 11th Avenue to the west. 50 Hudson Yards and 55 Hudson Yards are respectively located on the east and west side of the block. Work on the foundation of the 985-foot-tall (300 m) 50 Hudson Yards began in May 2018. The 780-foot-tall (240 m) 55 Hudson Yards started construction on January 22, 2015, and topped out in August 2017. Renovated 450 West 33rd Street building in Manhattan West, home to the Associated Press. Brookfield, a Canadian asset manager, is developing the second-largest project in Hudson Yards. Dubbed "Manhattan West" it will comprise six buildings, two of which are pre-existing structures undergoing substantial renovations. The project will include three office buildings, two residential buildings, and one hotel. The two principal office buildings and a public green space, open year-round, will be placed on a platform over covered tracks that lead from the West Side Yard to Penn Station. To facilitate construction Brookfield announced that it would use prefabricated parts to build the platform. Despite its considerable scale, Manhattan West has been referred to as "somewhat eclipsed" and "overshadowed" by the larger Hudson Yards. In early 2014, real estate firm Massey Knakal announced a conceptual supertall with a 1,220,000-square-foot (113,000 m2) capacity and 108 stories that would soar over 1,800 feet on the north side of 34th Street between Hudson Boulevard and Tenth Avenue in order to show the potential of a site that it intended to sell. Dubbed Hudson Spire and designed by MJM+A architects, it would be the tallest tower in the Western Hemisphere if completed. The site was later purchased by Tishman Speyer on April 30, 2014, along with two adjacent properties for a total space of 2,850,000 square feet (265,000 m2). The plans for The Spire were later replaced with plans designed by Bjarke Ingels Group, dubbed The Spiral. The building started construction in June 2018, and its design includes terraces to provide green space. Tishman has secured pharmaceutical company Pfizer as an anchor tenant. Even before the opening of any of the rail yard buildings, many businesses in the area have seen increased profits due to the project's construction. The Hudson Yards redevelopment program catalyzed plans to build new buildings along the future Hudson Boulevard. There has also been a development boom in the vicinity of the rail yard development. Among these are 3 Hudson Boulevard (formerly the GiraSole), located on 34th Street and Eleventh Avenue. 3 Hudson Boulevard is under construction, although it lacks an anchor tenant. In February 2015, the Chetrit Group, headed by Meyer and Joseph Chetrit, announced that it wanted to spend US$29 million to expand one Hudson Yards development site to 373,068 square feet (34,659.2 m2). It would add about 200,000 square feet (19,000 m2) of space to a site between 11th Avenue, 37th and 38th Streets, and Hudson Boulevard that previously allowed 173,000 square feet (16,100 m2) of retail space. A buyer would be able to split the space between two buildings. In June 2015, Tishman Speyer bought another lot between West 36th and 37th Streets on 11th Avenue; the lot was zoned for a 735,000 square feet (68,300 m2) residential and hotel property. It is next to a lot—zoned for a planned residential tower—that was bought in 2012 by Lalezarian Properties for $46.5 million, Tishman Speyer's land is also close to a lot owned by former New York Governor Eliot Spitzer, who bought the lot in 2013 and plans at least 414,000 square feet (38,500 m2) of new development space. Two other new Related buildings, One Hudson Yards and Abington House, are adjacent the Phase 1 buildings, but are unrelated to the Hudson Yards project. Another Related development also on the West Side dubbed "Hudson Residences" is under construction at the same time as Hudson Yards. For census purposes, the New York City government classifies Hudson Yards as part of a larger neighborhood tabulation area called Hudson Yards-Chelsea-Flat Iron-Union Square. Based on data from the 2010 United States Census, the population of Hudson Yards-Chelsea-Flat Iron-Union Square was 70,150, a change of 14,311 (20.4%) from the 55,839 counted in 2000. Covering an area of 851.67 acres (344.66 ha), the neighborhood had a population density of 82.4 inhabitants per acre (52,700/sq mi; 20,400/km2). The racial makeup of the neighborhood was 65.1% (45,661) White, 5.7% (4,017) African American, 0.1% (93) Native American, 11.8% (8,267) Asian, 0% (21) Pacific Islander, 0.4% (261) from other races, and 2.3% (1,587) from two or more races. Hispanic or Latino of any race were 14.6% (10,243) of the population. Hudson Yards is patrolled by the 10th Precinct of the NYPD, located at 230 West 20th Street. The 10th Precinct ranked 61st safest out of 69 patrol areas for per-capita crime in 2010. The 10th Precinct has a lower crime rate than in the 1990s, with crimes across all categories having decreased by 74.8% between 1990 and 2018. The precinct saw 1 murder, 19 rapes, 81 robberies, 103 felony assaults, 78 burglaries, 744 grand larcenies, and 26 grand larcenies auto in 2018. The Hudson Yards neighborhood is served by the New York City Fire Department (FDNY)'s Engine Co. 34/Ladder Co. 21 at 440 West 38th Street. However, there are no firehouses in or near the Hudson Yards real-estate development. Hudson Yards is located within two primary ZIP Codes. The area south of 34th Street is in 10001 and the area north of 34th Street is in 10018. The United States Postal Service operates the RCU Annex Station post office at 340 West 42nd Street. In addition, the James A. Farley Station, the main post office for New York City, is located at 421 8th Avenue. ^ a b "Hudson Yards Adopted Zoning Map". No. 7 Subway Extension—Hudson Yards Rezoning and Development Program Final Generic Environmental Impact Statement (PDF). New York City Department of Buildings. p. 4. Retrieved July 24, 2018. ^ Paul Crowell, "'Palace' Plan Out; Bigger One Urged," New York Times, January 6, 1956. ^ Robert E. Bedingfield, "U.S. Steel Weighs Midtown Project," New York Times, August 4, 1964. ^ George Horne, "670-Million, 40-Year Waterfront Plan To Alter West Side Is Urged by Mayor; Convention Center, Docks and Housing Would Be Built," New York Times, April 26, 1963. ^ "Developer Proposes a Convention Center in Midtown". The New York Times. December 18, 1975. Retrieved September 20, 2015. ^ Marilyn Bender, "The Empire and Ego of Donald Trump," New York Times, August 7, 1983. ^ "Hudson Yards Master Plan: Preferred Direction" (PDF). New York City Department of City Planning. February 2003. Retrieved August 10, 2009. ^ "HKNA plan" (PDF). Retrieved August 23, 2017. ^ City of New York, Hudson Yards financing proposal, July 12, 2004. ^ "City Set to Create West Side Development Unit". The New York Times. February 9, 2004. Retrieved July 17, 2018. ^ Bagli, Charles V. (June 22, 2004). "City Unveils Gigantic Plan To Transform Far West Side". The New York Times. Retrieved July 17, 2018. ^ Bagli, Charles V. (December 21, 2009). "Rezoning Will Allow Railyard Project to Advance". The New York Times. Retrieved December 22, 2009. ^ V. Bagli, Charles (March 22, 2005). "Jets and Rivals Increase Bids for Railyards". The New York Times. Retrieved June 29, 2018. ^ Bagli, Charles V. (August 28, 2008). "Dreaming of Stadiums and Souvenirs". The New York Times. Retrieved July 17, 2018. ^ Bagli, Charles V. (January 11, 2005). "Mayor and Council Reach Deal on West Side Development". Retrieved July 17, 2018. ^ Hope, Bradley (November 19, 2007). "Proposals for Hudson Yards Reach High, Green". The New York Sun. Retrieved June 29, 2018. ^ Brenzel, Kathryn (October 10, 2016). "Biggest Real Estate Projects NYC | 66 Hudson Boulevard". Therealdeal.com. Retrieved August 23, 2017. ^ Lisberg, Adam (November 19, 2007). "Plans For The Old West, Five major developers lay out visions for Hudson Yards". Daily News. New York. ^ a b Kates, Brian (March 27, 2008). "$1B Bid That Won West. Developer Nets Hudson Yards' Building Rights". Daily News. New York. ^ Editorial Desk (March 28, 2008). "Finally, a Vision for the West Side". New York Times. New York. ^ Bagli, Charles (May 9, 2008). "Deal to Build At Railyards On West Side Collapses". New York Times. New York. ^ Kates, Brian (May 23, 2008). "MTA Seals 1B Deal, Gets Yards On Track". Daily News. New York. ^ "MTA Finalizes Hudson Yards Deal". Metropolitan Transportation Authority. May 26, 2010. Retrieved October 4, 2013. ^ Samtani, Hiten (August 13, 2013). "Anatomy of a deal: Inside Related/Oxford's unusual financing of Hudson Yards". The Real Deal. Retrieved March 19, 2014. ^ Brown, Eliot. "Future of Immigrant Visa Program Has High-End Builders At Odds". Wall Street Journal. ISSN 0099-9660. Retrieved November 11, 2015. ^ "Hudson Yards Infrastructure Corporation". Nyc.gov. Retrieved August 23, 2017. ^ MTA Contract Presentation, October 10, 2006. ^ "30 Hudson Yards Connects to New No 7 Subway Station | Hudson Yards". Hudsonyardsnewyork.com. January 22, 2014. Retrieved April 1, 2014. ^ "Capital Program 7 Line Extension". MTA.info. December 20, 2013. Retrieved January 30, 2014. ^ "Mayor Applies For Funds To Redesign 7 Train Extension". NY1. June 30, 2010. Archived from the original on July 14, 2011. Retrieved June 30, 2010. ^ Dunlap, David W. (July 22, 2015). "A Garden Will Grow With Fans, Concrete, Coolant and 28,000 Plants". New York Times. New York Times. Retrieved July 22, 2015. ^ a b "Hudson Yards developers give update on project". AM New York. August 21, 2014. Retrieved August 21, 2014. ^ Hughes, C.J. (June 8, 2018). "New Parks Sprout Around New York". The New York Times. Retrieved July 18, 2018. ^ Bockmann, Rich (September 14, 2016). "Stairway to Hudson: Related unveils $150M sculpture". The Real Deal New York. Retrieved September 14, 2016. ^ "Hudson Park & Boulevard Will Be a Sweeping New Promenade Connecting to Hudson Yards". Hudsonyardsnewyork.com. January 22, 2014. Retrieved April 1, 2014. ^ "Hudson Park and Boulevard". Hudson Yards New York. Retrieved May 9, 2014. ^ Foderaro, Lisa (July 24, 2012). "City Acquires Last Segment of High Line From Railroad". The New York Times. Retrieved July 18, 2018. ^ "10 Hudson Yards fact sheet" (PDF). Retrieved August 23, 2017. ^ "New Design Concept for the High Line at the Rail Yards". Friends of the High Line. November 11, 2013. Retrieved April 1, 2014. ^ "Groundbreaking at the High Line at the Rail Yards". Friends of the High Line. September 20, 2012. Retrieved April 1, 2014. ^ Warerkar, Tanay (December 6, 2017). "Thomas Heatherwick's 'Vessel' tops out in Hudson Yards". Curbed. Retrieved July 18, 2018. ^ "Mayor Bloomberg, MTA Officials, and local leaders take first ride on 7 Subway Train Extension". MTA.info. December 20, 2013. Retrieved May 9, 2014. Hudson Yards is defined as the area bounded by Seventh and Eighth Avenues (East), West 28th/30th Streets (South), West 43rd Street (North) and Hudson River Park (West). ^ "The Master Plan - 17 Million Square Foot Mixed Use Development | Hudson Yards". Hudsonyardsnewyork.com. Retrieved July 10, 2016. ^ Taylor-Foster, James (March 22, 2014). "Construction Begins on the Vast Platform for New York's Hudson Yards". arch daily. Retrieved July 13, 2018. ^ Nick Stockton (March 24, 2014). "A Plan to Build Skyscrapers That Barely Touch the Ground". Wired. Retrieved April 16, 2014. ^ "Part of Hudson Yards Tunnels Is Nearly Done. Now It Sits, Unused". The New York Times. July 20, 2017. Retrieved August 30, 2018. ^ Kirby, Jen (May 31, 2016). "Take a Peek Into 10 Hudson Yards, the New Neighborhood's First Shiny Skyscraper to Open for Business". Daily Intelligencer. Retrieved June 1, 2016. ^ Nelson, Andrew (May 7, 2018). "30 Hudson Yards' Observation Deck And Parapet Nearly Complete". New York YIMBY. Retrieved June 28, 2018. ^ Walker, Ameena (April 4, 2018). "Tracking the biggest buildings taking shape at Hudson Yards". Curbed NY. Retrieved June 12, 2018. ^ a b "The Master Plan – 17 Million Square Foot Mixed Use Development | Hudson Yards". Hudsonyardsnewyork.com. January 22, 2014. Retrieved May 9, 2014. ^ Plitt, Amy (February 27, 2018). "15 Hudson Yards tops out as megaproject preps for spring 2019 debut". Curbed NY. Retrieved August 20, 2018. ^ Nelson, Andrew (June 19, 2018). "Related's 35 Hudson Yards Tops Out As Neighborhood's First Residential Supertall". New York YIMBY. Retrieved June 28, 2018. ^ Rosenberg, Zoe (January 2, 2019). "6 crucial ways New York City's landscape will change in 2019". Curbed NY. Retrieved January 3, 2019. ^ Bendix, Aria (October 7, 2018). "Hudson Yards is the biggest New York development since Rockefeller Center. Here are all the major buildings in the $25 billion neighborhood". Business Insider. Retrieved January 3, 2019. ^ "Progress Report: Hudson Yards". Chelsea Now. Retrieved February 21, 2015. ^ Plitt, Amy (February 19, 2018). "Could Frank Gehry and Santiago Calatrava be designing Hudson Yards towers?". Curbed. Retrieved July 12, 2018. ^ Dailey, Jessica (December 5, 2013). "Design Changes Revealed For Two Hudson Yards Towers - Rendering Redos - Curbed NY". Ny.curbed.com. Retrieved January 24, 2014. ^ Nelson, Andrew (May 11, 2018). "Excavation Wraps For Foster + Partners' 50 Hudson Yards As Foundation Work Begins". YIMBY. Retrieved June 28, 2018. ^ "55 Hudson Yards Tops Out 51 Floors and 780 Feet Above Street Level, Midtown West". New York YIMBY. August 22, 2017. Retrieved August 23, 2018. ^ Hughes, C.J. (March 17, 2017). "Hudson Yards, Meet Your New Neighbor, Manhattan West". The New York Times. Retrieved June 27, 2018. ^ Clark, Patrick (June 1, 2018). "Wall Street Firms Are Moving to the West Side. Here Come the Luxury Hotels". Bloomberg. Retrieved June 27, 2018. ^ "Deck Engineering & Technology". Manhattanwestnyc.com. Archived from the original on January 30, 2014. Retrieved April 1, 2014. ^ a b Cuozzo, Steve (January 2, 2018). "EY signs for extra space in One Manhattan West". New York Post. Retrieved July 20, 2018. ^ a b Hughes, C. J. (March 17, 2017). "Hudson Yards, Meet Your New Neighbor, Manhattan West". The New York Times. Retrieved July 20, 2018. ^ Alberts, Hana R. (February 6, 2014). "Meet Hudson Spire, The U.S.'s 'Potential Future Tallest Tower'". Curbed NY. Retrieved June 4, 2014. ^ "Tishman Speyer to develop Hudson Yards tower". Crain Communications. Bloomberg News. April 30, 2014. ^ "Tishman Speyer Acquires the Rights to Develop 2.85 Million Square Foot Tower in Manhattan's Hudson Yards District – Press Release". Digital Journal. April 30, 2014. Retrieved May 9, 2014. ^ Nelson, Andrew (June 18, 2018). "Tishman Speyer's BIG Supertall Spiral Officially Breaks Ground, Hudson Yards". New York YIMBY. Retrieved July 20, 2018. ^ "Business in Store as Hudson Yards Rises". chelseanow.com. August 6, 2015. Retrieved August 20, 2015. ^ Weiss, Lois (January 23, 2013). "Lucky '7' at 3 Hudson Blvd". New York Post. Retrieved June 4, 2014. ^ Warerkar, Tanay (November 3, 2017). "New looks at Moinian's Hudson Yards office tower, 3 Hudson Boulevard". Curbed. Retrieved July 20, 2018. ^ "Chetrit to pay $29M to double size of Hudson Yards site". The Real Deal. February 18, 2015. Retrieved February 21, 2015. ^ Daniel Geiger (June 10, 2015). 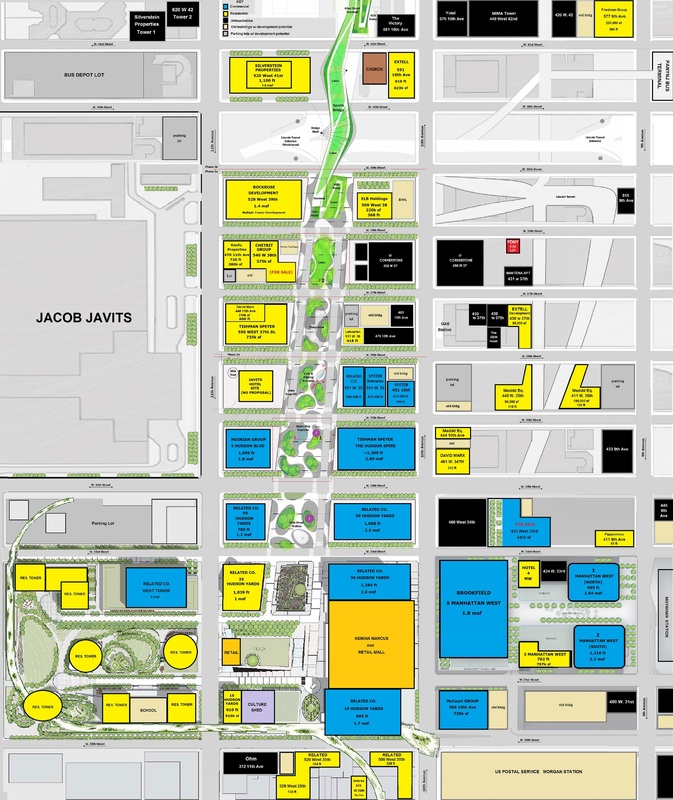 "Tishman Speyer is buying a development site across from Javits Center for $185M". Crain's New York. Retrieved June 20, 2015. ^ Rick Bockmann (June 11, 2015). "Lalezarian planning 38-story Hudson Yards resi tower". The Real Deal. Retrieved June 20, 2015. ^ Matt Chaban (December 27, 2013). "Eliot Spitzer's latest acquisition: Former governor's real estate company spends $88M for property on Manhattan's far West Side". New York Daily News. Retrieved June 20, 2015. ^ Warerkar, Tanay (May 23, 2017). "Related's pricey Hudson Yards rental will debut this summer from $5,095". Curbed. Retrieved June 28, 2018. ^ Schulz, Dana (January 10, 2018). "Robert A.M. Stern will design fourth Hudson River-front residential tower for Related". 6sqft. Retrieved July 18, 2018. ^ Tracy, Thomas (December 7, 2018). "FDNY union demands new firehouse for Hudson Yards development, citing traffic nightmares". New York Daily News. Retrieved March 23, 2019. ^ Scotto, Michael (March 21, 2018). "Union: Lack of FDNY coverage at Hudson Yards alarming". Spectrum News NY1 | New York City. Retrieved March 23, 2019. ^ Warerkar, Tanay (March 23, 2016). "Legal Battles Surrounding the Hudson Yard's Chinese Lantern Tower Drag On - Curbed NY". Ny.curbed.com. Retrieved August 23, 2017. ^ Warerkar, Tanay (December 8, 2016). "Foster + Partners will design 985-foot Hudson Yards skyscraper - Curbed NY". Ny.curbed.com. Retrieved August 23, 2017. ^ Plitt, Amy (March 8, 2017). "Manhattan West's first rental building, the Eugene, opens its doors to residents - Curbed NY". Ny.curbed.com. Retrieved August 23, 2017. Davidson, Justin. "From 0 to 12 Million Square Feet" New York (October 7, 2012). "An Investment That's Paying Off: The Economic and Fiscal Impact of the Development of Hudson Yards" (PDF). hudsonyardsnewyork.com. Hudson Yards. May 2016. Wikimedia Commons has media related to Hudson Yards Redevelopment Project. This page was last edited on 3 April 2019, at 21:07 (UTC).